Chris is passionate about results – for individuals and for organizations. That’s why his messages are filled with useful skills that can be immediately applied for results. Unlike the current crop of “motivational speakers” that just entertain, Chris provides a path to accomplishment. Chris Ross has been a performance consultant, trainer, lecturer and presenter for over 30 years. In his work with over 800 clients, he has learned tremendous lessons in what creates long-lasting and sustainable change – and what does not work! His clients call him back over and over again because he helps them to achieve results. And he does this by using his expertise, sense of humor and genuine enthusiasm for people. 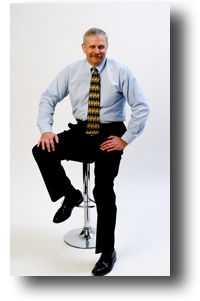 Chris Ross . . . .
is an internationally recognized speaker, author, coach, and performance consultant in the areas of leadership, talent management, employee engagement, strategic planning, organizational culture change, and board consulting. is a skilled facilitator, workshop leader and keynote speaker who has conducted over a thousand presentations who can bring his expertise and skill to your organization to bring focus, change and engagement. will totally customize delivery for your audience to ensure that the right message, the right mind-set and the right skill-set reaches and motivates participants to learn and perform. This customization includes discussion with key staff or meeting planners and ideally interviewing several meeting participants in advance of the event to get various opinions and the “inside scoop”. This helps to ensure that your audience will receive exactly what they need – delivered with enthusiasm and energy! works with all kinds of groups – from non-profit organizations, to government agencies, to small businesses, to large corporations. offers all kinds of sessions including keynote speeches, conference break-out sessions, half-day, full-day and muli-day workshops, presentation skills workshops, train-the-trainer workshops, facilitation and moderating focus groups or discussion groups. See more workshops and seminars here. Chris is a member of and has presented to: American Society of Training and Development, American Society of Safety Engineers, International Society for Performance Improvement, National Ski Patrol, Society of Human Resources Professionals and Toastmasters International.